Alas, the Crimson Court DLC has been pushed back a bit. Red Hook Studios previously revealed that its punishing RPG Darkest Dungeon was to get a new mode that would cut the length of game roughly in half, and it seems that update may be just around the corner. In a new blog post, the developer explains the changes in a little more detail, while announcing that its "goal for Radiant mode is to have it ready for PC/MAC/Linux release by early February". Red Hook helpfully adds that early Feb is "mere weeks away", so there's no need to consult your calendars. From (probably) early Feb, you'll be able to pick from three difficulty options when embarking upon a new adventure: Normal, Radiant and Stygian. That last one was previously known as New Game+, but you'll soon be able to select it from the off, if Darkest Dungeon's regular difficulty is not severe enough for your liking. Radiant, meanwhile, "is not being designed to be an 'easy' mode. 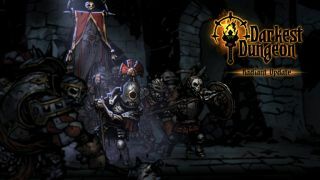 The intent is to adjust things that typically affect the time it takes to build up your roster and assault the Darkest Dungeon", with the end goal of reducing the average playtime from around 80 hours to 40. If I'm understanding things right, it will essentially cut down on the grinding necessary to finish the game. There will also be various quality of life tweaks coming in Darkest Dungeon's future, along with new baddies for the game's Champion dungeons. There'll be a "small public beta" before the Radiant update goes live—however, it's not all happy news: the release of the first expansion pack, The Crimson Court, has now been pushed back a bit (although it never had a firm date to begin with). "After the decision was made to double down and add content as part of the Radiant update," the post concludes, "this unavoidably shifts Crimson Court date a bit, but we feel this is for the greater good of the game. A significant amount of work has already been completed for the Crimson Court, and we are estimating it will ready in April. We will update you as we make progress, so keep your eyes peeled for more art and information!"